How to Choose a iPhone Earphones that fits you. What things do I need to consider when buying earphones? There are basically four things you should take into consideration when shopping for iPhone earphones(buds). Fit - This is by far the most important factor for any earphone. Â If they fit is wrong it can hurt, bass will not be exact, and you’ll feel you’ve wasted your money. Â Since these days it is hard to walk into a store and try on earphones as easily as it is to walk in and try on shoes, you’ll have be dutiful in finding out the return and/or shipping policy of the brick andÂ mortarÂ or online shop you bought them from. Â But above all else, if the earphones you order don’t fit your ears than you must return them. Â Else you’ve wasted money. Â Or you can try out third party ear tips for better fit, isolation, and comfort. Â Most earphones only come with three fit sizes, but some manufacturers are starting to see that isn’t enough. Â The current set of Monster iSports we had in for review had six different tip sizes. Â And more manufacturers are doing this. Â Also the better the fit the more likely the earphones will stay in while you move around. Â But in the list below we are only considering earbuds which don’t have a brace and most, no matter how well the fit, will pull out of the ears rather easily. Sound Style - There are actually to factors to consider here with sound style. Â One is the actual tonal character of the earphones and the other is the sound pressure they produce. Â In the list below we have done our best to describe the tonal color and sonic characteristics of the recommended earphones, but sonic pressure each earphone produces effects use on an individual level. Â The pressure from earphones, if too great for a persons ears, can cause listenÂ fatigue and head aches. Â Part of this is the sonic character of the sound but another part is how much of the soundÂ pressurizesÂ your ear drum. Â Â One might not notice at first, but after some time you’ll become uncomfortable and be happy to pull the earphones out and let your ears breath. Â Unfortunately this is such an individual issue that it is hard to give recommendations. Â But if you want earphones don’t fret. Â If at first you don’t succeed, return and try another pair. 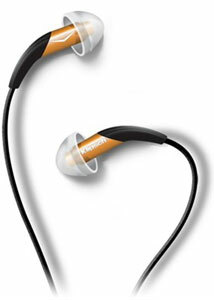 Â Here at work one person couldn’t wear the iMetal earbuds but had not issue at all with the ClarityOne earbuds. Â It just depends on you. Quality - Lets face it, earphones, headphones, break. Â And no matter how much you pay for them, and how much you care for them, they will most likely break at some point or another. Â So starting off with a solidly built earphone and good care is the best prevention to thisÂ tragedy.Â FortunatelyÂ all the headphones on this list are well build. Â The only one to have user feedback over build quality are the Monster Beats Tour – but Monster appears to have a very goodÂ warrantyÂ dept. ControlTalk - This allows you to control the audio from your cable. Â Integrated with the mic section on the yoke, ControlTalk able earphones give you the ability to pause, play, stop, RR and FF your audio. Â You can also use ControlTalk with the iPod Shuffle’s voice control system. CNET – The Monster Beats by Dr. Dre Tour In-Ear Headphones offer much in the way of style and sound, but the extra-long earpieces my cause comfort and fit issues for some users. CNET – The Klipsch Image X10i headphones are a great option for iPhone and iPod owners who listen mainly to lossless audio. TechCrunch – These headphones have a very narrow application window, but if you have an iPhone, want a fantastic sounding headset, and donâ€™t mind dropping $350, go for it. CNET – The Skullcandy 50/50 earbuds offer big bass and useful features for a reasonable price–just don’t expect top-notch construction. 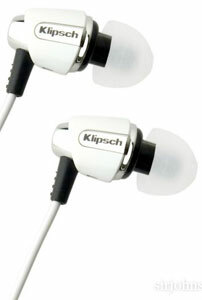 CNET – The Klipsch Image S4i earphones offer up sound quality on par with and better than sets that cost many times as much, and they include compelling extras for iPhone and iPod users. PC Mag – For $100, you get a great-sounding pair of earphones that controls the latest iPods and iPhone, and even works with the iPod shuffle voice-over feature. The ClarityOne earphones are fantastic. They are brand new and we have a sample for review. Granted they aren’t specifically made for the iPhone like the above models are but for $129 you get every penny worth of good sound. Clean mid-range, real punchy bass and detailed and extended highs. Actually these are so good we have been using them on more than just the iPhone because well – they are capable of pointing out the weakness in standard MP3 and iPhone DAC. $250 sound for half the price.The ClarityOne earphones use a the “Pure Sound Processor” system that in essence it â€œcouplesâ€ the speaker to the amplifier. These earphones get around the distortion caused by Lenz law to create a truly audiophile experience at a consumer level cost. 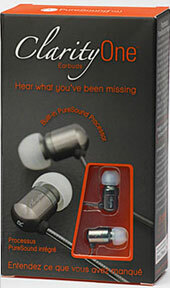 All harmonic detail is passed from the iPhone or MP3 player of your choice into the ClarityOne earphones. Without getting into too much detail lets just say that we are very impressed with these earphones and they come highly recommended. Why does this list seem so incompleet? What about de B&W C5? What about Sennheiser? What about ….? Agreed. I own the B&W P5′s and they are the best sounding headphones I have ever owned!! !